Key Findings From The Launch Of Aditya Birla Sun Life Retirement Fund! Several weeks ago, Aditya Birla Sun Life Mutual fund launched a solutions-oriented fund for retirement planning, having a lock-in period of five years. For those who aren't aware of what a solutions-oriented fund is, it is a scheme that helps investors in long term investment for a specific goal either a child's future or your retirement fund. Initially, it was a part of equity or balanced scheme, but post the SEBI reclassification, it has been categorised separately. In its press release notified in Moneycontrol, the fund house mentioned that their NFO- Aditya Birla Retirement Fund has collected Rs 166 crore, garnered through 23,743 applications, 42% of which are from B30 cities. It stated that almost 40% of the applications were made via the SIP route. The fund house has also managed to add more than 7,000 new customers to its existing investor base. An interesting feature to note about Aditya Birla Retirement Fund is that the Scheme offers four different Investment Plans according to the age bracket and different risk profiles of an individual. Each Investment Plan will be managed as a separate portfolio. The 30s Plan: Will invest 80%-100% of the corpus primarily in a well-diversified portfolio of equity and equity-related securities. The 40s Plan: Asset exposure to equity and equity related instruments will be between 65%-80% with marginal allocation to debt and money market instruments. The 50s Plan: Will invest 75%-100% in debt and money market instruments with marginal allocation to equity and equity related instruments. The 50s Plus - Debt Plan: Invests only in various debt securities and money market instruments issued by corporates and/or state and central government. Mr A Balasubramanian, Chief Executive Officer, Aditya Birla Sun Life AMC, speaking on the fund said, "The most interesting insight coming from Aditya Birla Sun Life Retirement Fund is that the maximum applications have come for the 30s plan. This is a clear indication of the maturity of investors who understand the importance of long-term financial planning at an early age and are ready to stay on course through disciplined investments. The strong proposition of our fund with the scope to pick the suitable asset allocation and at various entry, age is further substantiated by the fact that the next highest number of applications came for the 50s plus debt plan." From the details shared by the fund house, it is seen that retirement planning is slowly pacing up especially amongst the millennial Indians and those who are on the brink of retirement. Note that, the Aditya Birla Sun Life Fund was launched with the core objective to help investors align their investments as per their retirement needs by offering four different portfolio options. Each option has varying levels of risk-adjustable returns suitable for individuals in each age bracket. And that construction of each portfolio has its own investment strategy. Hence the performance of the fund relies on the efficacy of the fund managers ability to construct each portfolio to handle the risk emanating from it. Thus, before investing, assess the performance of the fund over a period of three to five years, along with your own investment goal and risk profile. In my view, instead of relying only on a retirement fund because of the lock-in period, I would prefer creating a strategic portfolio and invest in a well-diversified mutual funds for my retirement planning. 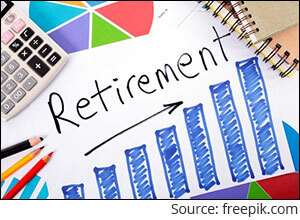 Editor's note: If you want your retirement to be blissful, don't miss out on PersonalFN's Retire Rich service. Equitymaster requests your view! Post a comment on "Key Findings From The Launch Of Aditya Birla Sun Life Retirement Fund!". Click here!